Thanks to www.MoonstoneShop.com for sponsoring this post! We had a brief heatwave at the end of last week, it was up to 100°! 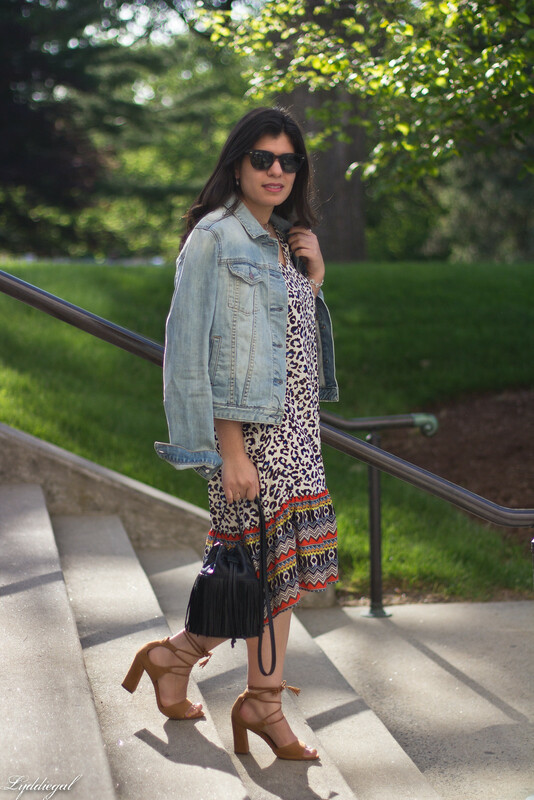 What better than a heatwave to make me feel like dressing a little bit bohemian? 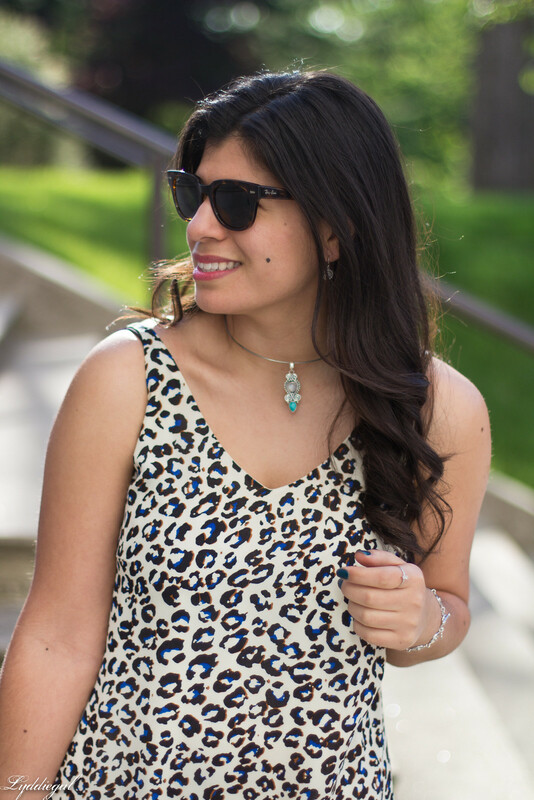 I was heading out to dinner at Bartaco with my sister, so I grabbed this fun mixed print slip dress and paired it with the Rainbow Moonstone jewelry that I'd just received from www.moonstoneshop.com. 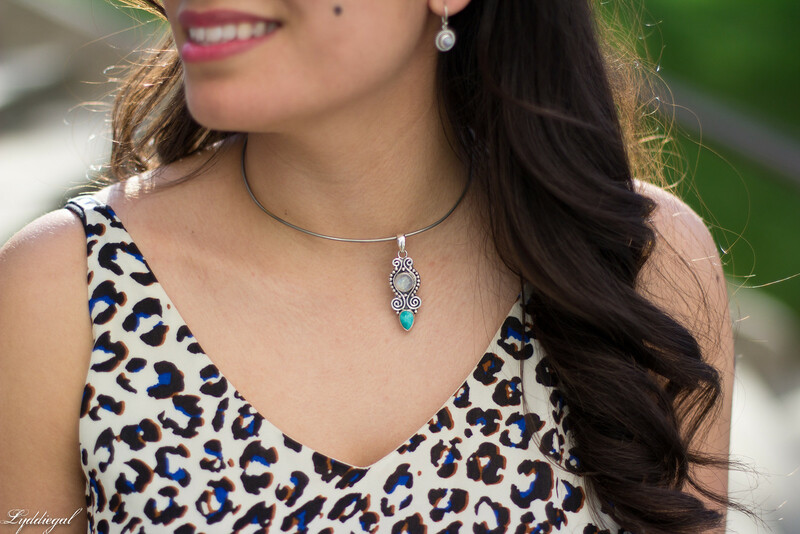 All of the pieces are handmade in Florida with genuine moonstone and sterling silver, and some incorporate other stones, like the lovely turquoise in the pendant. As I don't wear too much silver, I forgot that I didn't have a chain for the pendant, but then I found this silver choker which belonged to my mother, and conveniently chokers are having a moment again. Naturally my favorite piece is the ring, I just love wearing delicate little rings on my index finger and www.moonstoneshop.com has so many other rings which would be fabulous for stacking. www.MoonstoneShop.com provided me with jewelry for the purpose of this post. My views and opinions are my own. Such cool pieces! And I love them paired with that wild dress! That heatwave was something else, wasn't it? Came home to the heat, haha. That dress really is perfect and the denim jacket over top makes it so modern!! Great print on that dress ! here its been hellish too, so that I have the worst cold ever. We had a major heat wave recently too (low 90s), but now it is in the low 70s. It is nice before the extreme heat & humidity sets in for good. Love that dress on you! It is adorable! I love that ring too, it's so delicate and pretty! 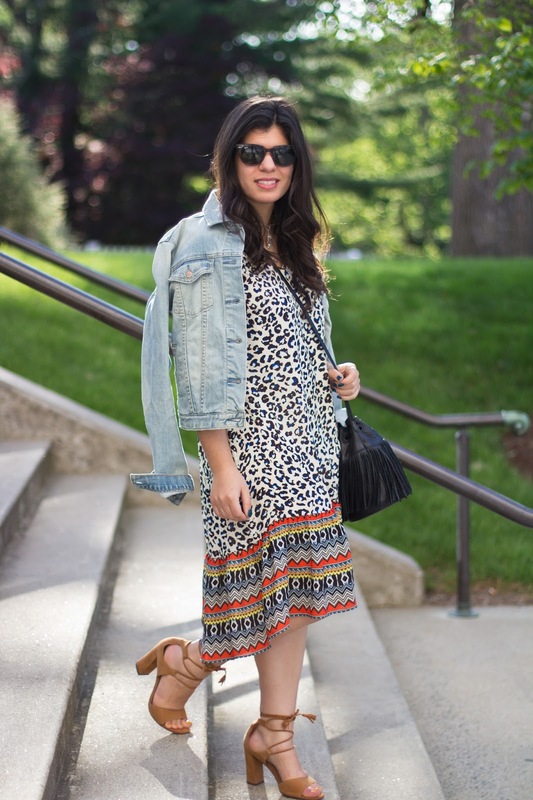 The built-in print mixing on the dress is great, and I think I need those sandals. They look a little high for me but the heel is nice and chunky at least. Wow that is so hot! I remember living in Florida the Summers are brutal. I love the choker and moonstone. It's gorgeous on you! 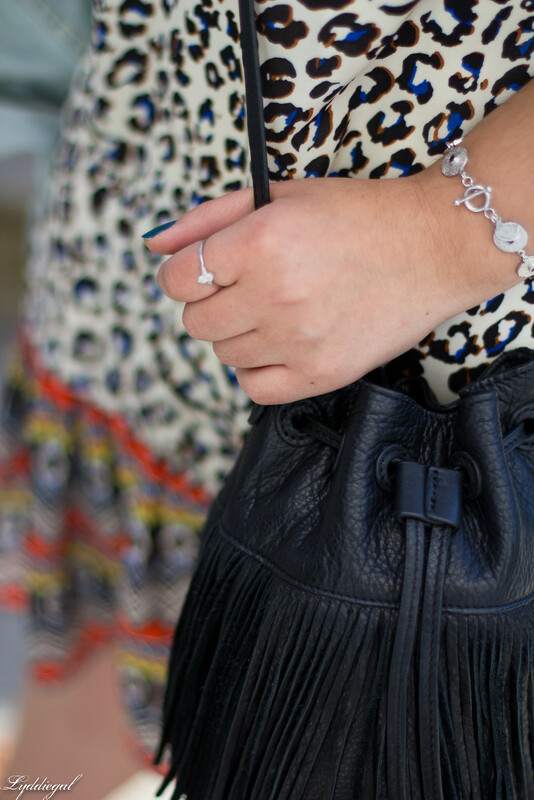 Love the moonstone jewelry, and that boho dress is so pretty! That dress is so pretty and the jewelry is the perfect accent! Love love this look on you! The dress is fab and so are your jewelry!! You look gorgeous and that dress is so pretty. So is your jewelry. I love that beautiful dress and stunning jewelry! The choker necklace worked perfectly for your charm! That's such a pretty printed dress! I really like the denim jacket with it too. I've been wearing dresses and denim jackets a lot lately, it's a good outfit formula for cooler mornings and evenings but warmer days like we are having now in Brisbane. Even though it's autumn here, complete opposite season from you, haha! I wear the combo a lot in spring too. You've got great style! 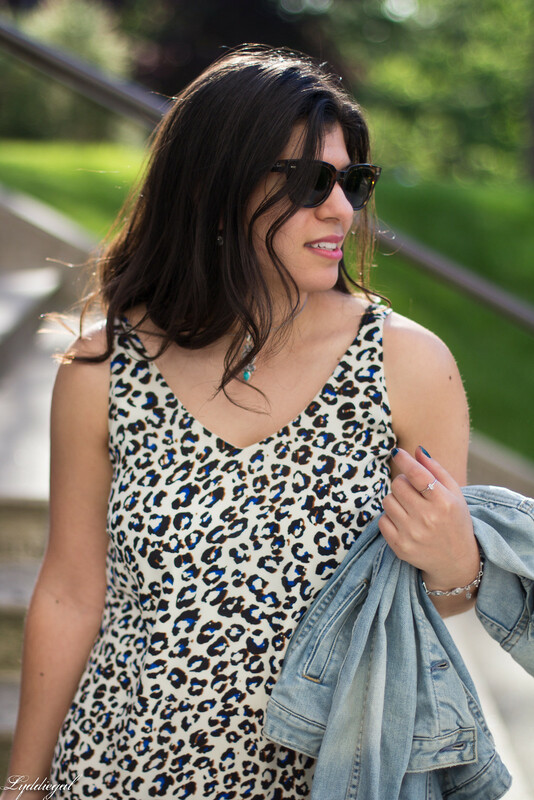 Love the cheetah print dress with the jean jacket- so cute! Oh, where do I begin about this dress? If there was ever a piece of clothing that could inspire me to experiment with colours and prints in one go, I think this would be it. I just love the non-traditionally coloured leopard print and the flared detail on the skirt is too fun. I can't think of a better choice for dinner out in the middle of a heat wave, it's the perfect fun in the sun piece and it really does pair well with your denim jacket and silver jewels. I love this dress on You and those shooze. . . 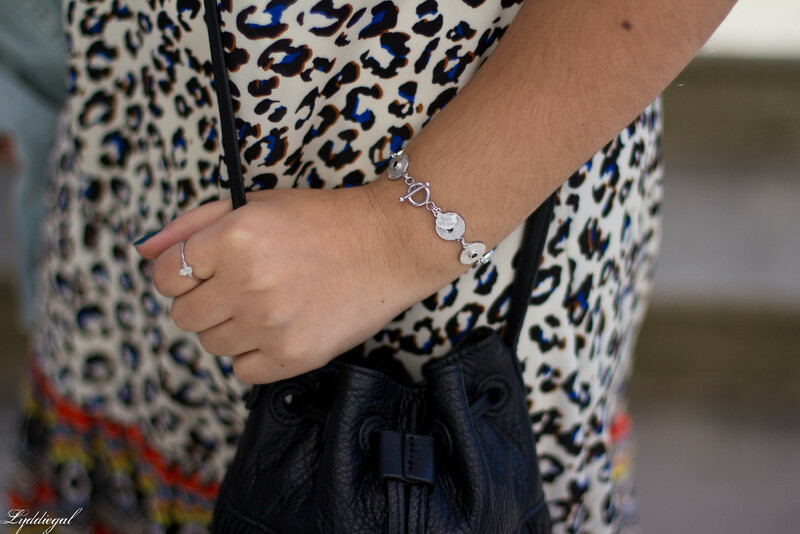 I love any silver jewelry with hints of turquoise! So pretty! Thanks for sharing, dear! love this look on u. your dress is very pretty and necklace is too good.